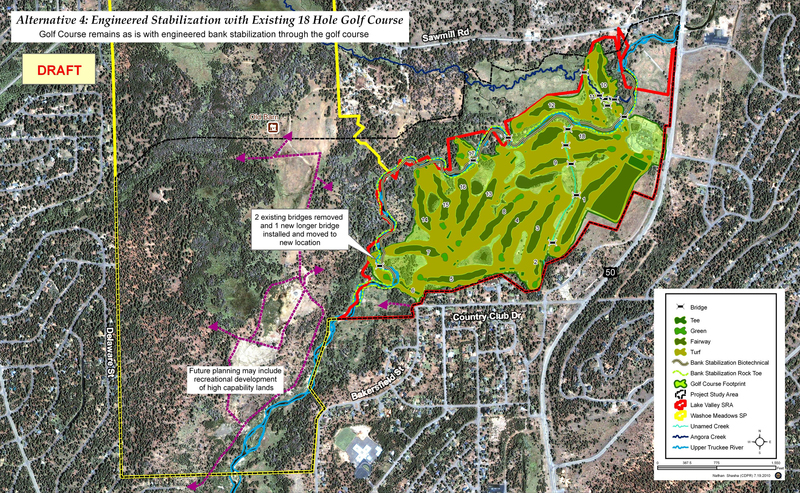 Alternative 4: River Stabilization with Existing 18-Hole Regulation Golf Course This alternative would include installing large rock rip rap, biotechnical and rock bank protection, and boulder grade controls along the river. The golf course would remain in its current configuration. Holes 6 and 7 bridges would be removed and replaced with one longer bridge for golf access, but no recreational access would be permitted over the bridge because it is in the area of golf play. There would be no change to the roads and trails on the west side of the river. The alternative leaves the existing 18-hole golf course unchanged.